Doing it Differently: The Altar is ready. 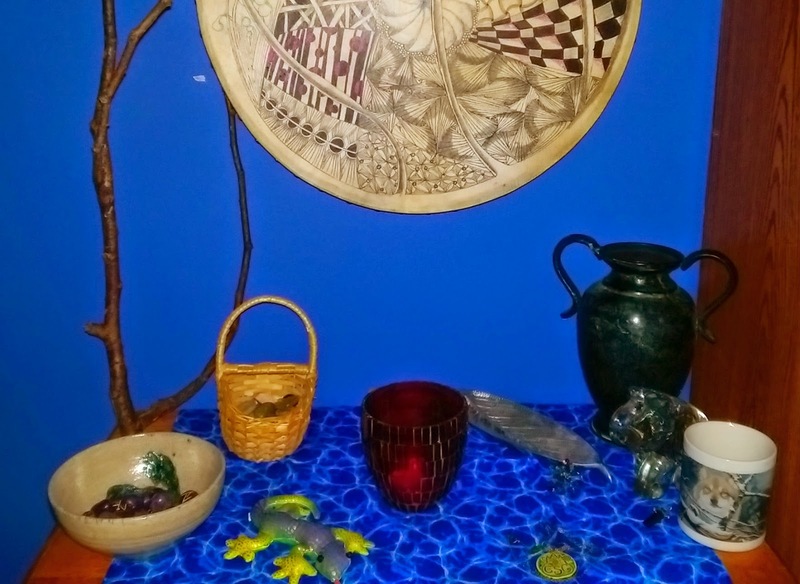 The Drum (that hangs above) is my drum; I sometimes use for Journey work, and drum circles I go to. It is decorated using Zentangle, and it means a lot to me as a doorway to the other side, and a doorway between my spiritual side and my artistic side. The branch, (Left rear)Represents the Tree, this branch is from a cedar tree from our yard that was blown over in a storm. This branch has many meanings: It is from a cedar tree, and I belong to the Cedarsong ADF grove. It was from a storm damaged tree, the grove is strongly associated with Perkūnas the Baltic god of the storms. The tree that fell, is one that I loved sense my friends moved into this house, and I was saddened when it fell. This is also the end of the branch, that I will be using to make a wood burned set of runes. The Bowl, (Left Front) This is a bowl I found secondhand that called to me. It represents the bowl Sigyn uses to catch the poison set to drip on Loki. I also use it to hold my set of Amethyst runes, the stones I will use when seeking advice from the shining ones. The Basket (Next to the tree), this basket (I am looking for a better container), holds a variety of stones, ones I collect from important places, and some I have received from my brother after his death and from my ex-wife, there is also a sharks tooth given my by the boy child I live with. Each stone here is either tied to a place or person that is important to me. The Lizard, (right foreground), I have always had a strong tie to the lizard, and it was one of my first spirit guides. This is a stuffed lizard that looks quite a bit like Vincent my lizard spirit guide. The Fire, (Center), this is the representative of the fire in ADF, it is a red broken glass candle-holder, and another secondhand find. The Leaf (next to the fire), this is a leaf my ex-wife used to own, and left here in Lansing, when she moved following her love of the land. It is a stick incense holder, and I will use it when I burn any incense as Martha is partially responsible for me really starting to work out my spiritual path. The Well (Right Rear), this is yet another second hand finds, I was looking for something to represent the well, and this romanesque pot work perfectly. The Necklace (In front of the leaf), this is my basic Cedarsong Grove necklace. I am making one that is more representative of the grove and my beliefs, but I am still waiting on supplies. The Elephant & the Mug, (Right Front), these represent recently passed ancestors (well really all my ancestors), the elephant is a paperweight I bought my mother from a garage-sale when I was five years old, that started her amazing elephant collection. The coffee mug belonged to my brother Mike, and I received it when he passed. I use the Mug to hold my runes made of buffalo bone, that are used when seeking advice from the ancestors. What is to come: as add the remaining items to my altar, I will post about each item on its own.